For your convenience, we accept Cash, Check, Visa, MasterCard, American Express and Discover. 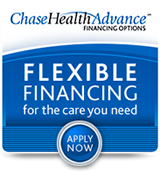 We also work with CareCredit and Chase Health Advance which allows us to offer Interest-Free and Low-Fixed Rate payment programs to qualified patients, which makes dental care more affordable. Our goal is to maximize your insurance benefits and make any remaining balance easily affordable. If you have any questions regarding your insurance benefits, please do not hesitate to call us. As a service to our patients, our practice accepts most PPO dental insurance programs, including non-managed care, indemnity (traditional) and PPO out-of-network. We are not part of any managed care network. Our accounting staff will prepare all the necessary forms for your dental benefits. However, we remind you that your specific policy is an agreement between you and your insurance company.